Shopping Center Business is the leading monthly business magazine for the retail real estate industry. 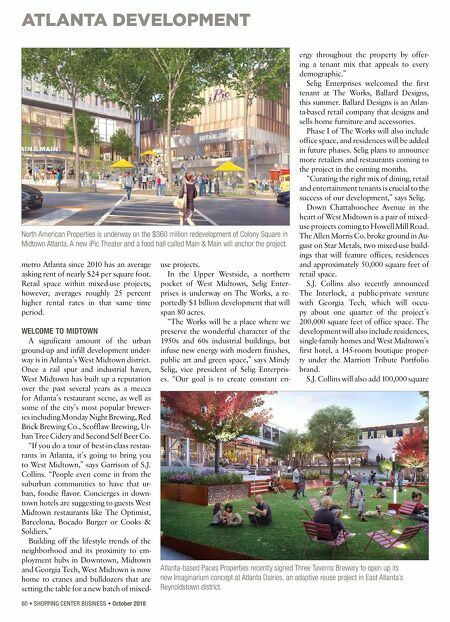 ATLANTA DEVELOPMENT October 2018 • SHOPPING CENTER BUSINESS • 61 feet of retail space at The Interlock, which is about a mile away from Georgia Tech's campus at the intersection of Howell Mill and 14th Street. Garrison says that the company is targeting unique restaurants that will build off the momentum already established at West Midtown staples like Westside Provisions District. "You can expect to see a lot of first- to-market retail and restaurants coming in," says Garrison. "We're not going to bring anything that's not super special to this West Midtown foodie culture. We've been traveling across the country and right now we have at least three or four restaurants that will be first-to-market or satisfy a certain niche. We're also targeting a bodega grocery concept." Across the Interstate 75/85 connector in Midtown, NAP is underway on one of the larger projects in the city, the $360 million redevelopment of Colony Square. NAP's Weinert says that the Midtown sub- market is a developer's dream because of its strong demand drivers but lack of competition. "The market is demanding a criti- cal mass of retail in Midtown," says Weinert. "Midtown has everything that you would want to have in a mar- ket development story, like daytime population, tourism, local resonance, 77 cultural institutions, public trans- portation — everything but a critical mass of retail." 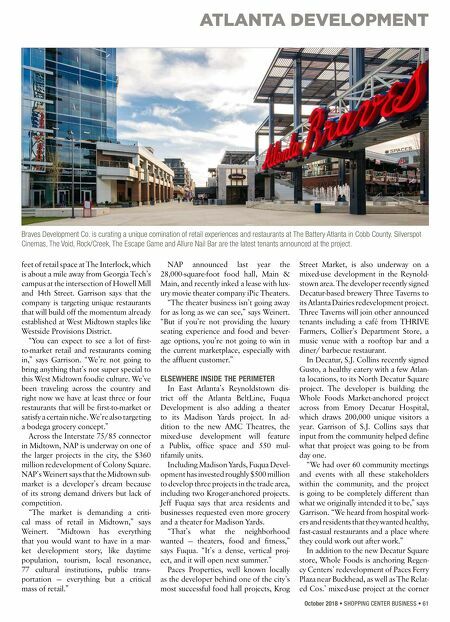 NAP announced last year the 28,000-square-foot food hall, Main & Main, and recently inked a lease with lux- ury movie theater company iPic Theaters. "The theater business isn't going away for as long as we can see," says Weinert. "But if you're not providing the luxury seating experience and food and bever- age options, you're not going to win in the current marketplace, especially with the affluent customer." ELSEWHERE INSIDE THE PERIMETER In East Atlanta's Reynoldstown dis- trict off the Atlanta BeltLine, Fuqua Development is also adding a theater to its Madison Yards project. In ad- dition to the new AMC Theatres, the mixed-use development will feature a Publix, office space and 550 mul- tifamily units. Including Madison Yards, Fuqua Devel- opment has invested roughly $500 million to develop three projects in the trade area, including two Kroger-anchored projects. Jeff Fuqua says that area residents and businesses requested even more grocery and a theater for Madison Yards. "That's what the neighborhood wanted — theaters, food and fitness," says Fuqua. "It's a dense, vertical proj- ect, and it will open next summer." Paces Properties, well known locally as the developer behind one of the city's most successful food hall projects, Krog Street Market, is also underway on a mixed-use development in the Reynold- stown area. The developer recently signed Decatur-based brewery Three Taverns to its Atlanta Dairies redevelopment project. Three Taverns will join other announced tenants including a café from THRIVE Farmers, Collier's Department Store, a music venue with a rooftop bar and a diner/ barbecue restaurant. In Decatur, S.J. Collins recently signed Gusto, a healthy eatery with a few Atlan- ta locations, to its North Decatur Square project. The developer is building the Whole Foods Market-anchored project across from Emory Decatur Hospital, which draws 200,000 unique visitors a year. Garrison of S.J. Collins says that input from the community helped define what that project was going to be from day one. "We had over 60 community meetings and events with all these stakeholders within the community, and the project is going to be completely different than what we originally intended it to be," says Garrison. "We heard from hospital work- ers and residents that they wanted healthy, fast-casual restaurants and a place where they could work out after work." In addition to the new Decatur Square store, Whole Foods is anchoring Regen- cy Centers' redevelopment of Paces Ferry Plaza near Buckhead, as well as The Relat- ed Cos.' mixed-use project at the corner Braves Development Co. is curating a unique comination of retail experiences and restaurants at The Battery Atlanta in Cobb County. Silverspot Cinemas, The Void, Rock/Creek, The Escape Game and Allure Nail Bar are the latest tenants announced at the project.